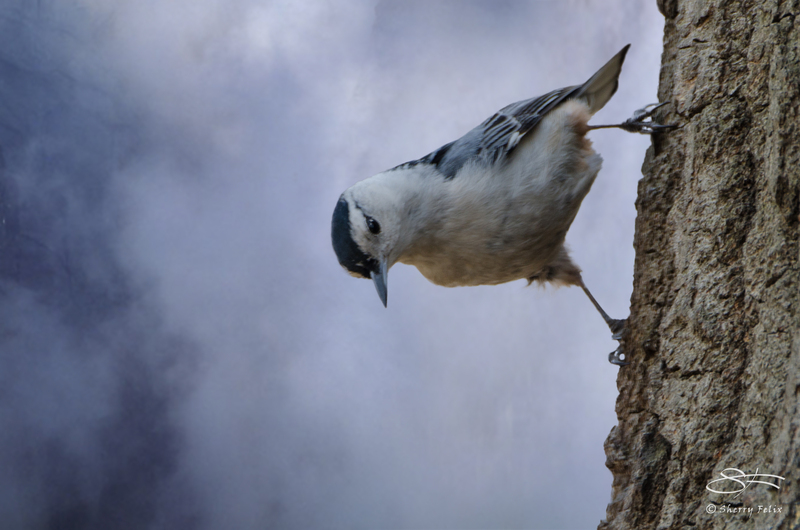 I put a cloudy sky behind the Nuthatch to eliminate a noisy background. No other enhancements were necessary for this sideways standing Nuthatch with attitude. Composite created in Photoshop 10/3/2014. NIKON D7000, f-stop f/6.3, exposure time 1/640 sec., ISO 100, focal length 600mm, and max aperture 5. I think this is a great picture. It is very alive. The nuthatch almost looks like it is about to move. I nearly got vertigo watching this bird! This one is really weird. The bird looks like it is tree climbing. When I look at this photo carefully, I can see that the nuthatch is standing sideways on the trunk, but my first impression was . . . oh, this photo is displayed sideways. Silly of me, probably, but I really thought it was a mistake at first.